The epitome of my blog: embracing your flaws and having fun while you learn from them. My guest today, Liz Bayardelle, dives into the topic of learning to love failure by watching our children when they come across challenges. Accept and overcome. Family, Fun, and Flaws is a participant in the Amazon Services LLC Associates Program, an affiliate advertising program designed to provide a means for sites to earn advertising fees by advertising and linking to amazon.com. One of the most exciting milestones for any parent is watching your child learn to walk. First, there’s the absolutely mind-bending experience of seeing your baby as an official “toddler”, because about fifteen seconds ago she was this little helpless thing in a swaddling blanket. But even more than that, it’s so fun to watch all their little attempts at walking before they actually get the hang of it. Call me a sadist, but I couldn’t get enough of watching my little critter grit her teeth as she used various pieces of furniture (or pets…or siblings) as props as she slowly navigated her way across the room. The best part was when she finally started walking (well, attempting to walk) by herself. She would get a few steps in and then get distracted by something shiny and go tumbling to the floor in a riotous mass of misplaced limbs and toddler giggles. For a while, I actually worried that she’d never learn to walk properly because she had so much more fun falling down. On a much less adorable note, around the time my little girl was learning to walk, I was going through a tough personal transition. I had left my “real world” job to be a full-time mom when my daughter came, but I quickly discovered that without at least a little work or external purpose in my life I would go, to use a clinical term, absolutely bat-crackers crazy. However, finding part-time work that can be done remotely in the dead of the night or while breastfeeding a baby is not as easy as one might think. Every time I didn’t hear back about a job application I sent in, every time another door seemed to close in my face, I saw it as a personal failure. Not just a failure, I saw it as a statement about my worth as a human being. What? They don’t want to hire you? You clearly don’t deserve food and oxygen, loser. One day I was hosting a pity party of one while watching my daughter’s daily session of falling (I mean walking) practice. I was watching her tumble head over tiny toes time and time again, giggling all the while. I noticed that she was getting farther and farther across the room with each try. At least one of us is making progress in life, I bitterly noted in my head. I’m not sure what metaphorical anvil fell on my head to make me finally connect the dots, but, as I watched her giggle-fall her way across the room, I realized that she wasn’t deterred at all by her repeated “failures”. She didn’t even see them as failures. She saw them as fun. Each time she crashed to the floor, she just saw it as information. “Hmmm…so walking works better if you don’t take two steps in a row with the same foot…interesting…” And up she’d pop to try again, armed with the new knowledge she’d gained from Walking Experiment, Test Case #372. Then it hit me that this was why she liked falling so much more than actually walking. She didn’t learn anything new from walking successfully. What she really liked was the rush of learning that came from trying something she couldn’t do, failing utterly and completely, then failing over and over again, getting more information from each failure, until suddenly she could do it right. As I sat there watching her sprawl repeatedly across the office floor, I realized that this is the case with all kids. They like challenge. They like new things: things that are scary, things that they fail to do…repeatedly. No kid wants to walk up stairs for fun; they want to go to a rock climbing wall and try the hardest thing there over and over until they get it (or you drag them out by their hair). Why do kids like challenge? Because that’s how they learn to do bigger, better, scarier, more exciting things. And in that moment I felt (for neither the first nor last time) so dramatically awed by this little critter I had created. We’re supposed to teach our kids, but anyone who’s ever parented knows that it often goes the other direction. After giving it a few minutes of self-reflection, I came to the conclusion that if I could apply half of her attitude to my life, there would be no stopping me. And so a resolution was born. Every time I “failed”, every time I got a no when I wanted a yes, every time I did the adult equivalent of falling on my still-postnatally-large booty, I would try to be more like my toddler. I started trying to view “failures” not as condemning evidence that I wasn’t good enough as a person, but as experiments that showed me what not to do. Each failure had a purpose, a lesson to teach me, a little nugget of wisdom that would let me go into the next round smarter and wiser. It was by no means an easy switch to make in my mind, but every time I successfully adjusted my mindset it relieved a great deal of stress. Even more shockingly, after a few weeks of using my toddler mindset, I actually began getting better results. The phone started ringing and I was soon getting the work results I had been so pessimistically sure I would never be able to achieve. So, next time you find yourself succumbing to the temptation to take your mistakes, failures, or missteps too seriously, think of your cute little human learning to walk and try to act more like a toddler. Liz Bayardelle is the founder of The Stay Sane Mom, an online resource to make life, marriage, and parenting easier to manage for multitasking moms. While based in California, Liz and her born-and-raised New Yorker husband parent two daughters (an Instagram-obsessed teen and a toddlernado), two dogs (a ‘fraidy-cat Great Dane and a mad scientist trapped in a husky’s body), a rabbit the size of a large house cat, and a modest-sized herd of dust bunnies. When Liz gets to be a real human (aka nights and nap time), she’s a Ph.D. candidate in business psychology, freelance web developer/graphic designer, workout masochist, and avid bookworm. Please, remember to sign up to my email list so you never miss anything flawsome around here! And grab your freebie on how to Get Lost in Your Child and really engage with them even on busy days (I’m off to sling a little slime now.) If you’d like to work with me, find out how! To see your words in my blog, contact me today for a guest spot! 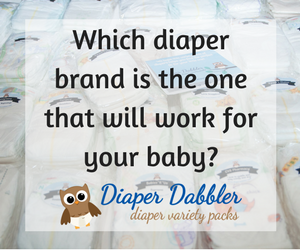 If you have a little in diapers but aren’t sure which brand may fit the best for their little tush, feel free to try a mixed selection with the Diaper Dabbler! You are so amazing and doing a great job thanks for sharing this story. I agree, I’m grateful she shared her story with us!